China’s proposed tariffs on US petroleum imports, part of a mounting trade war between the two countries, would crimp sales to the shale industry’s largest customer, adding new pressure on US crude prices, energy executives and analysts said in interviews this week. China has said it would slap a 25 per cent tariff on imports of US crude, natural gas and coal on July 6 if Washington went ahead, as planned, with its own tariffs on Chinese goods that day. Energy would be added for the first time to a burgeoning trade dispute that has hit imports of Chinese metals and solar panels, and exports of US medical equipment and soybeans. Targeting petroleum puts the Trump administration’s "energy dominance" agenda in Beijing’s cross-hairs as US shale has grabbed share from Middle East suppliers in Asia. China is the largest customer for US crude, importing about 363,000 barrels a day in the six months ended in March. Thomson Reuters shipping data shows those exports have increased since, rising to an expected 450,000 bpd in July. "It is going to hurt everyone for the short term," said Ron Gasser, vice president at Mammoth Exploration, a west Texas shale producer. While US crude will continue flowing to market even with tariffs, "it’ll force you to put your oil somewhere else, and it’ll cost you more" to line up other buyers. US oil exports have steadily grown since the four-decade-old ban on crude exports was lifted at the end of 2015. China’s tariff threat caught US producers off guard because it had been discussing buying more US energy and agricultural products to reduce its $375 billion trade surplus with the United States. The levies could boost suppliers of West African crude at the expense of US exports. 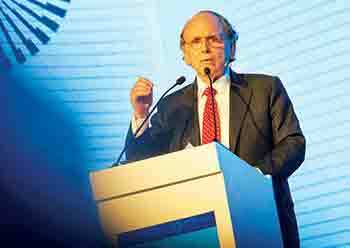 The tariffs are "creating a whole new set of uncertainties on top of what’s already there," Daniel Yergin, vice chairman of consultancy IHS Markit, said as he arrived in Vienna to attend this week’s Opec’s International Seminar. Opec oil ministers will gather to consider sharply increasing the group’s production this year, a move advanced forth by Saudi Arabia and Russia.